The Hague, 17 October 2018: Iraq’s newly-appointed Ambassador in The Hague, H.E. Dr. Hisham Al-Alawi, visited the Headquarters of the International Commission on Missing Persons (ICMP) today, where he met ICMP Director-General Kathryne Bomberger and senior members of staff. Director-General Bomberger briefed Ambassador Al-Alawi on ICMP’s global operations and its program in Iraq, where it has worked for more than a decade with political leaders, forensic experts, and families of the missing to address the country’s complex missing persons issue. 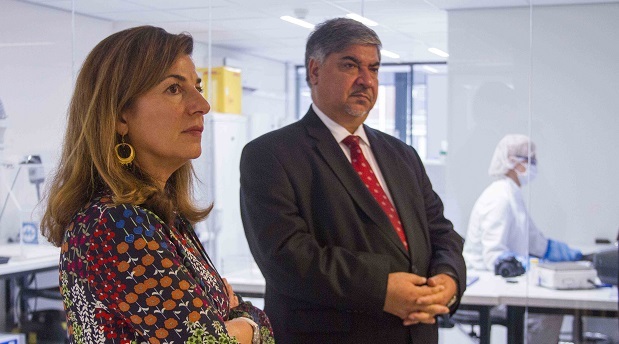 She also provided Ambassador Al-Alawi with a tour of ICMP’s high-throughput DNA laboratory system. Ambassador Al-Alwi expressed appreciation for the support that ICMP has been able to give its partners in Iraq and stated that he looks forward to continued cooperation. Director-General Bomberger said ICMP wishes to continue working in partnership with Iraq to assist the country in developing a sustainable strategy to locate missing persons and to secure the rights of all families of the missing. She briefed Ambassador Al-Alawi on ICMP’s Online Information System (OIC) and Identification Data Management System (iDMS) which enable families of the missing and relevant authorities to provide and access information on missing persons cases. The OIC and iDMS are components of a holistic DNA-led identification system that could significantly enhance the capacity of stakeholders in Iraq to account for missing persons. Estimates of the number of missing in Iraq range from 250,000 to one million. ICMP has helped the country to develop long-term strategies to account for missing persons regardless of ethnic, religious or national origin and to secure the rights of families regardless of the circumstances of disappearance. It has provided extensive training in the recovery of mass graves and the collection of reference samples, and together with the relevant institutions, it has worked on the excavation of mass graves. ICMP has also donated forensic equipment and software to build a centralized data system. It has helped to create legislation, such as the Law on Mass Graves Affairs, which is a model law that can be emulated around the world, as well as legislation required under the Convention for the Protection of All Persons from Enforced Disappearance, which Iraq ratified in 2010, and it has supported efforts to empower families of the missing, particularly widows and single female heads of household. ICMP is a treaty-based intergovernmental organization with Headquarters in The Hague. Its mandate is to secure the cooperation of governments and others in locating and identifying missing persons from conflict, human rights abuses, disasters, organized crime, irregular migration and other causes and to assist them in doing so. It is the only international organization tasked exclusively to work on the issue of missing persons.